We recently completed a concrete countertop for a fire pit in Bedford, VA. Most people hear “concrete countertops” and they imagine us coming into their home to form & pour concrete right in their kitchen. There are many reasons we like to pour countertops in our shop, but the main reason is that our process is messy. We start by forming the countertops out of a smooth material called melamine. The concrete countertops are formed upside down, so the texture of the melamine is what gives the concrete a flat surface. After the forms are built, we caulk & seal them so that concrete cant leak out between any of the boards. At this point we are ready to pour the concrete countertops. We start by spraying the forms with a colored concrete grout mix. This spray is what will eventually become the surface of the countertop. Once the surface has been sprayed, we make another batch of concrete that has glass fibers in the mix. This mix is called GFRC. (Glass fiber reinforced concrete). We pour the GFRC mix on top of the sprayed face coat and screed the concrete level to the top of the forms. Once the concrete has set, we remove the forms and flip the concrete over. Then we wet polish the entire surface with progressively finer grits of diamond impregnated pads. Once we get the concrete polished to the customers desired level of sheen, we seal it to protect it from stains. 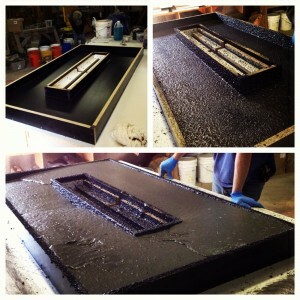 Click here for a free tutorial on how we make concrete countertops. The next day , we delivered the concrete countertop to the job site and buffed it one last time. I took a few photos as we were building the concrete countertop for the firepit so that you can see exactly how we did it. Is it possibelt to ask of a materiale list, with pictures 😊. My english is not that good 😉. Thank you. OK, so when you say spray a concrete grout mix, how thick are you talking? Couldn’t you hand apply it? And what exactly do you use for a sealer? More than one coat? Seems I could do this right side up in place, putting a layer of grout along sides before concrete and then a layer on top, floating it really smooth before polishing. Yes? No? Thanks for the info. Some people do it that way. Its more difficult to polish a hand finished slab than a pre-cast slab on melamine though. It also takes a lot more time to sit there and wait on the concrete to set up before you can start troweling. I’m curious about the spraying of the concrete grout mix, is this a paint spray gun or how exactly does that process take place? Thank you. This is a hopper gun made for decorative concrete. We use it to spray concrete overlays too. What are the dimensions of the one shown here ? The top and the opening for the pit ? We make our own mix from scratch and add integral color. You can buy pre-bagged mix with pre-bagged colors from concrete countertop suppliers. What sort of access door is there? There is a door on the side of the rock base. Awesome project! Me and my wife are wanting to do something similar to this with the poured concrete forms being the top of a gabion bench. Im definitely taking notes from your project. Thank you for sharing! Thanks for the comment! I just posted a link to a video here that shows you how we make countertops that might be helpful to you. Your delivered product is beautiful! I’d like to do something similar at my house as a DIYer. Are there concerns about how heat affects the edges of the cast top? For example, I’m looking at a 42″ burner that generates ~210,000 BTUs. The inset opening would be 10″ X 50″. Thanks in advance for sharing your experience. It depends on the sealer you use. I wouldn’t use an epoxy sealer on it because it could get burnt… It might make more sense to use some sort of penetrating sealer.